Priyanka Chopra and Nick Jonah officially married today (December 1) at a Western ceremony in Rajasthan, India. The actress, 36, married the 26-year-old musician at the glamorous Umaid Bhawan Palace in Jodhpur just four months after their July engagement. 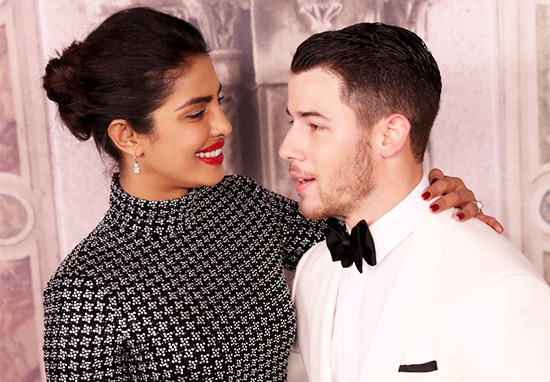 Jonas proposed to Chopra after only three dates. The pair and their whole wedding company were kitted out in Ralph Lauren designer wear. Ralph Lauren has previously only made wedding gowns for his family members including his daughter, daughter-in-law, and niece, but made an exception for the famous Bollywood actress. Chopra, who was listed as one of Forbes 100 Most Powerful Women in 2017, was graced with an array of designs for her to choose from for the wedding. The Indian celebrity and American singer have spared no expenses in their extravagant soiree. There is over-the-top entertainment, celebrity guest list, and lavish welcoming packs for the three-day extravaganza. The Royal palace is lit up with laser beam lights and each guest has been warned they’ll need a holiday to recover from the wedding. All attendees of the affair have to carry around a special card at all times and have been gifted a special personalised silver coin that features Lord Ganesha and Lakshmi on. The service will include a traditional Indian celebration as well as a Christian one. Nick confessed to Vogue he will be taking part in all the Indian traditions, including arriving on a horse ‘dressed like a king’ wearing a turban and holding a sword. During the interview Priyanka checked that her fiancé was comfortable riding horses, but he was quick to reassure her that he couldn’t wait to make his grand arrival. Due to the strict no phones policy the couple have, there are zero photos of the wedding so far. There is a lot of anticipation for Priyanka’s dress though. A few photos of the ‘information guide’ for the couple’s wedding were leaked on Twitter. Looks like a novel. And I put my drink down, get on one knee—this is in front of a bunch of people—and I say, ‘You’re real. Where have you been all my life?’ Like, loud. He said ‘I love the way you look at the world. I love the drive you have’. As a girl, I’ve never had a guy tell me, ‘I like your ambition,’ It’s always been the opposite. Jonas proposed in Crete on what Chopra thought was a birthday trip. Thoughtful Jonas waited until after midnight so that their future anniversaries wouldn’t coincide with her birthday celebrations. Nick and his brother Joe had closed down a Tiffany store a few weeks before in order to pick the ring out. I got down on one knee, again, and I said: Will you make me the happiest man in the world and marry me? No joke—she took about 45 seconds. Forty-five seconds of silence. I said to her ‘I’m going to put this ring on your finger now unless you have any objections. In India, Jonas has acquired a national nickname playing on the Hindi word jiju which means brother-in-law or sister’s husband, so he is known as ‘National Jiju’.